Pedigree Yarn Hill Lincoln Reds graze the historic water meadows of the Mann family’s farm in Iken, near Woodbridge. Proud members of the Red Tractor Assurance Scheme, the Premium Cattle Health Scheme, FWAG and LEAF, the farmers behind prize-winning Yarn Hill Lincoln Reds are dedicated to the highest standards for welfare, production, and environmental practices. 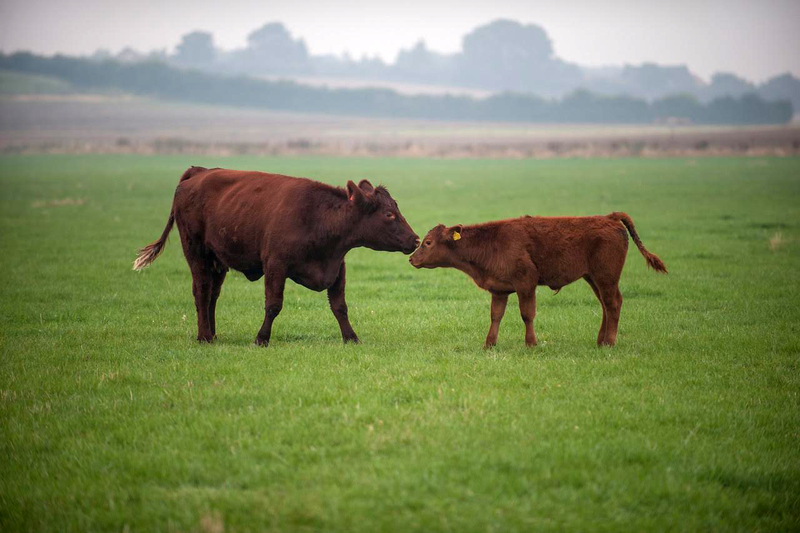 In their idyllic setting on marsh fields by the River Alde in coastal Suffolk, Yarn Hill Lincoln Reds roam freely in family groups, and calves are only weaned when they have outgrown their mothers. A slow-growing breed, the native rare-breed Lincoln Red is ideally suited to finishing on this nutrient-rich grass. The result is finely marbled beef with exceptional flavour and texture. Passionate about animal welfare, conservation and high-quality produce, Natasha began breeding Lincoln Reds on the family farm in 2006 after the water meadows were restored to grass, creating the perfect pastures. Yarn Hill Lincoln Reds enjoy a natural, peaceful life grazing the marshlands and roaming freely in family groups. The herd includes more than 100 breeding cows plus followers and prize-winning pedigrees. One of the oldest native beef cattle breeds in the UK, hardy but gentle Lincoln Reds thrive with a stress-free life on grass, producing finely marbled meat that’s tender and succulent with incredible flavour. "We have been working with Natasha and Richard Mann for a few years, and myself and my team at Direct Meats love going to the farm to see their idyllic set up. The cattle always look beautiful grazing the Iken marshes around the Suffolk estuaries. You can never fail to see the love and passion Natasha and Richard have for their cattle." Natasha Mann began breeding Lincoln Reds on the family farm in 2006 after the water meadows were restored to grass, creating the perfect pastures.